Death of Monopoly: Canadian game-design contest! 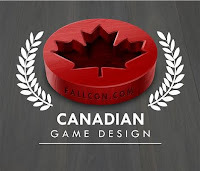 FallCon in Calgary announced that they are looking for entries for a new annual game designing competition. The information is here. I have pages upon pages of ideas and yet I still have not put together a single prototype to try out. I think I have this weird fear that the game I produce will be completely unplayable. I really must get over that. yeah design something! !1 I'll play it! Do it, do it, do it!!! You'll have a few players over here in BC for sure!